Hulk Hogan, born Terry Bollea, burst onto the professional wrestling scene in the late seventies and went on to become a world wrestling champion many times over. From humble beginnings, this giant of a man escaped a pre-ordained life of dock and construction work in Port Tampa, Florida, to become one of the most recognizable celebrities on the planet. He did it through sheer will, grit, determination, and a drive to always go over the top and do more than what others thought possible. From the outside, his story was one of a charmed life—he was at the top of his career, had a wonderful and loving family, and a lifelong fan base who worshipped him. Of course he had his up and downs—including hints of steroid abuse and his falling out with WWE and Vince McMahon—but it’s been the last two years that have tested Hogan more than any other in his lifetime. him for the breakup and his son went to jail. The tabloid media had a field day. When unflattering jailhouse conversations between him and his son were released to the press the tabloids were in a frenzy. The sudden turmoil and tragedy surrounding Hogan took its toll. He fell into a deep depression, seeing no way out, until one fate ful phone call. 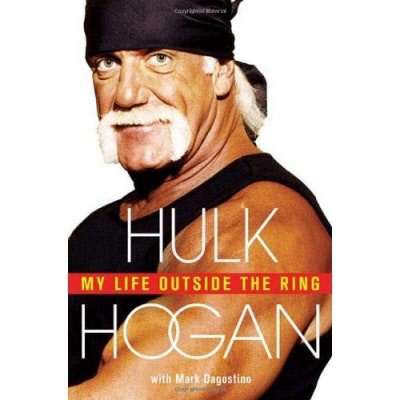 In My Life Outside the Ring, Hogan will unabash edly recount these events, revealing how his new found clarity steadied him during the most difficult match of his life—and how he emerged from the battle feeling stronger than ever before. I was right there leaning on the side of the car with my hands when I finally saw Nick—my only son—folded up like an accordion with his head down by the gas pedal. “Nick!” I yelled. I could see he was alive. He turned his head, he stuck his hand out, and gave me a thumbs-up. For a second I was relieved. Then the chaos set in. The noise of engines. Sirens. A saw. Para - medics pulling John from the passenger seat. So much blood. I can’t even describe to you how panicked I was. The police and firefighters surrounding us seemed panicked, too. The firefighters started cutting the side of the car open to try to get Nick out, and I’m still standing right there when I hear my boy screaming, “No, no, no, stop! Stop! You’re gonna cut my legs off. Dad! Just unbuckle the seatbelt. I can get out!” So I reach in and I push the button on his seat belt, and Nick just crawls right out. His wrist was broken. His ribs were cracked. None of that mattered. He was gonna be okay. But not John. John wasn’t moving.